A superb instrument, built for the stage, but with an endearing acoustic voice. If you're a performing musician, you must try one. Build quality. Playability. Truly versatile (and, as such, decent value for money). It's seriously hard to find any faults here. Now well into his fourth decade of instrument making, we take a look at George Lowden's latest acoustic, the super versatile 32SE Stage Edition. Despite a rocky past business-wise, Lowden has been a family owned business based in Downpatrick, Northern Ireland since 2004, and is now very much back where it should be: at the top of the Brit-making pile. Here we take a look at the new 32SE 'Stage Edition'. The genesis of this guitar lies with the LSE, "a limited stage edition in the 1990s", says George Lowden. "For the 32SE we drew from the LSE design but used the new Lowden F body shape," which was updated and re-voiced in 2004. To Lowden novices, the brand has three basic body shapes: O, the original and the largest shape; the F, medium size, which originally stood for 'flat picker'; and the S, as in small, the trimmest of the trio. "Way back in 1982 I only had the larger body [O] and felt I needed to design a medium size as well," continues Lowden. "I thought it would be a good way to approach a flatpicking guitar: to start with a middle size. However, what has happened since then with the re-voicing is that it has turned out to be a more versatile instrument. You can use it for flatpicking but also for any other finger or strumming style - it's a very versatile size." We really can't disagree. 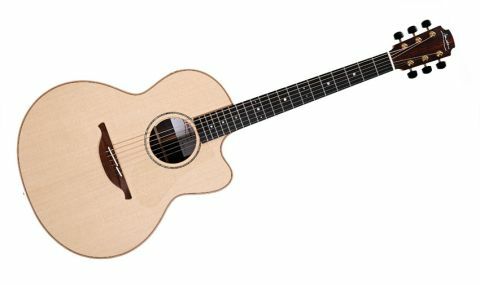 This is the trimmest-depthed Lowden, the slimmer body thickness not only reduces the size of the body chamber and limits some low end - the potential troublesome area in terms of onstage feedback - but it creates a very comfortable, intimate guitar. Viewed from the side you see Lowden's usual bottom-to-top curved taper, which again really seems to help the comfort factor. It's all solid, of course, richly dark/milk chocolate-stripped rosewood for the back and sides, highly figured sycamore binding with simple black/ white/ black purfling inside the top's edges. Lowden's standard nut width is 45mm, which is nice and airy for fingerstyle players, but here the tighter 'American' width of 43.5mm is used with a very standard 55mm string spacing at the bridge. It gives a very mainstream feel, enhanced by the 406mm (16-inch) fingerboard radius and subtly V-shaped neck profile that is dimensionally thicker (21.3mm at the 1st fret, 24mm at the 10th fret) than it actually feels in the hand. The neck is a five-piece laminate construction: three larger pieces of mahogany are separated by two much thinner rosewood strips. The use of cedar has featured considerably in Lowden's past, along with various spruces, but here the tightly figured Sitka spruce top is given an illusion of over-thickness due to the reinforcement around the inside edge of the soundhole. Barely visible is the guitar's transparent plastic pickguard, the only gloss feature on an otherwise beautifully satin- sheened, hand-buffed polyurethane finish. Under the top we have Lowden's own-design A frame and the original 'dolphin profile' bracing - both features that hark back to early Lowden guitars of the mid-70s. The pinless bridge's curved back edge gives a distinctive shape and with it the two-piece saddle, providing efficient compensation and resulting intonation that's extremely accurate. As with many serious guitars, the nut is also moved forward to improve lower position intonation. It's hard to find fault with anything here. Pickup systems are optional extras on the majority of Lowdens (although all the acoustics have a pre-drilled hole to accept an endpin jack, which is plugged by an over-sized base strap button), but here the LR Baggs Anthem system is pre- fitted. The Anthem comprises an Element under-saddle, Tru-Mic bridge plate transducer and soundhole-mounted rotary 'thumbwheel' controls for volume and pickup mix, push switches for phase and battery check plus a trim pot to adjust the level of the mic: it's perhaps our favourite current electro- acoustic pickup system. One of the most versatile acoustics we've had in our hands for a while, the 32SE has a breathy texture, a little bit of dirt when pushed and doesn't sound as pianistic as perhaps many more modern guitars of its type. "It really is a jack-of- all-trades, most of which it masters effortlessly"
It gives the 32SE an authentic character for older-style finger- or hybrid-picked blues and it's a great bottleneck guitar, too. But for rhythm beds it's near perfect: the slightly trimmed low end tightens up its acoustic voice and you just know it'll sit with bass and drums perfectly. But then that breathy edge really suits Latin styles or jazz where again the trimmer low end adds focus to bassline or chord melody styles. It has a wide dynamic range, too, but not so wide that you need to really watch your right hand - it's quite forgiving in that regard. Solos also have body on the higher strings in the upper registers. It really is a jack-of- all-trades, most of which it masters effortlessly. The 32SE is an electro, and once we get our head around the controls there's not a huge difference between the Tru-Mic or Element; both have that modern tonality we mentioned in issue our recent LR Baggs Lyric and M80 review. Certainly on this platform, it falls on the right side of the sweet/harsh line and we find the diverse acoustic styles of the 32SE are easily reproduced through amps or a PA. There's excellent feedback rejection, too. The 32SE is quite simply one of the best-suited stage electros we've encountered. It doesn't want to be pigeonholed stylistically, and either acoustically or amplified seems able to suit a broad range of styles. It feels, too, like a very comfortable pair of shoes - all the rough edges are worn away.